Auction Closed. Sold via Buy Now $800. Next Auction Monday Feb 18. It’s been a long time since our last “Day in Vermont” video. Somehow, we managed to pick a 15 degree morning to shoot a new one. Most of my “plein air” paintings are a combination of outdoor and studio work. The exact ratio depends on light, my stamina, and other unpredictable forces of nature. Please enjoy the new video! Peter, when I look at your paintings, I get this feeling in the pit of my stomach. It is a mixture of longing and familiarity and fondness. 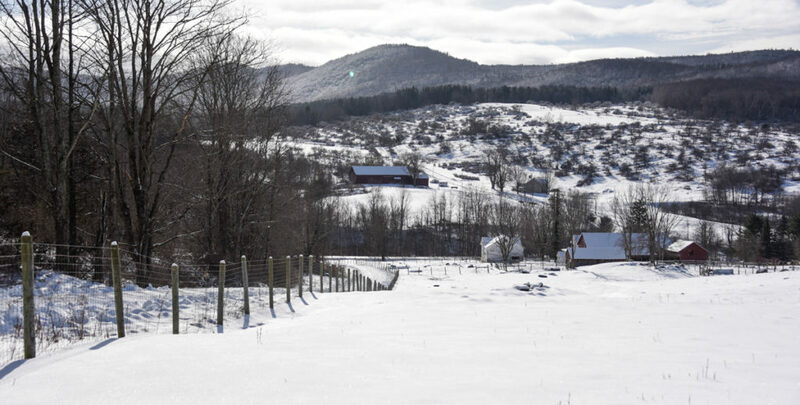 I certainly don’t miss those cold winter days, but I do miss the beauty of Vermont. Thank you for bringing me back! A snowy day in Vermont .. well done .. but waiting for Spring here ! Thanks for sharing your creative process, so fascinating to see how you work! Fascinated with your process! Now, I want to try holding brushes as you do and using larger ones. I tend to work too “tightly.” Thank you for sharing! The longing to be in Vermont becomes more acute each time I view your paintings. This was so interesting! Thank you for sharing this with us, Peter. Hearing how you decide on colors and shading and what you “see” was amazing. I’ve never had the chance to hear from an artist as to what he does when creating. This was beautiful. Wow. That was a fascinating peek into what you do. Thank you for sharing. 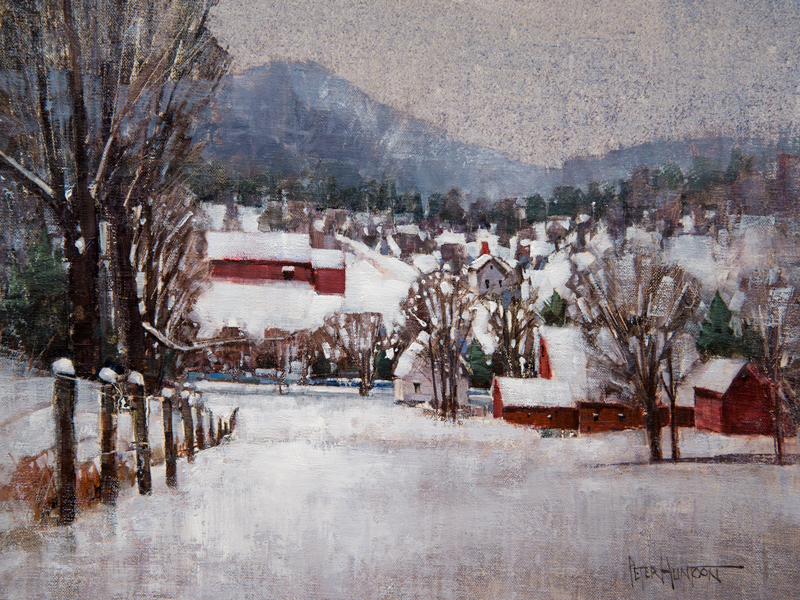 It’s fascinating to see your process and the finished painting captures the essence of the Vermont rural landscape in winter. Love it! Thank you for sharing the process of your painting style. I love the barns and rolling landscape of Vermont and miss it very much. I was born there and now live in Florida. Your emails and paintings keep me connected in a fun way. skill with which you create them was a wonderful treat. Thank you for sharing. I will definitely watch for more. I love looking over your shoulder while you paint. It’s like watching a magician doing a trick. First there’s nothing there. Then, the box opens and the beautiful assistant appears! The difference is that in your case, we get to watch while you slowly assemble her! Kind of like you with a piece of wood on the lathe. Thanks Dave! Love your definition of when you’re done with a painting. Also love the grainy texture of the sky. Hey, did you lose a couple pounds? Love it, scenery is beautiful! So amazing! Now there is VERMONT! Thanks for the fun video! Simply gorgeous! Once a Vermonter, always a Vermonter!!! Peter… I Love / Admire your Juicy Yet controlled ” Pronouncements on your canvas! ! ! You achieve such subtlety – yet fact, with the most delicate ‘ Strokes’ of paint,,,Wow! Thanks so Much Pete ~ ~ ~ ! ! !! ! That was so great to watch! You are truly amazing!! Thank you for that, love and miss Vermont!! I love your paintings. This one is especially beautiful Thanks for sharing the video..
What a wonderful gift to find this among my emails this morning. I had been longing for some art and some nature in my journal writing today. Thank you for supplying both. 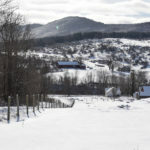 Recalling a beautiful trip through the Vermont countryside with my best friend years ago from equally chilly Minnesota. Absolutely LOVE watching and looking at your work. Your right, there is that creative zone. So enjoyed this. Thank YOU so much! Wow! Another one of your paintings to enjoy. So reminds me of my years growing up in Vermont. Enjoyed the video and watching your creative process. Thank you so much for sharing this video. As an artist myself, watching you and your thought process is always so helpful. I also love to watch how you move the paint and your brush on the canvas..and of course, the fabulous final product. I continue to be amazed at how you just swipe a little patch and it somehow becomes a building !!!! I love to watch your videos. Thank you…..I still hope to visit and watch you in action. Freezing greetings from Iowa! I Love Vermont. I am always attracted to your paintings of barns as I grew upon a farm in northern Ohio. I loved driving around the countryside viewing the different pastoral scenes on vacation. Thank you for sharing this. Love watching you work. My folks are from E.Dorset and that scene looks a lot like the orchard part way down the mountain. Can you tell us where it is? Middletown Springs, where I live Anne. The old Burnham Hollow orchard painted from Sundog Lane across the way. So interesting , i took a painting course at castle ton, it was so structured I felt a failure. Wish you had taught it. Awww – thanks, Peter – a gift today – loved being outdoors with you – sorry it was so cold. I thank you for your beautiful paintings, showing us your creative process, and your colorful, vivid descriptions. As a writer, I believe I enjoy your “word paintings”, almost as much as your artwork. That wonderful Yankee accent is enjoyable, as well! Thank you! PETER : If a picture is worth a thousand words ….. we’ll then your painting of “ Orchard View Farm” just speaks volumes. Just an awesome painting and video. You definitely have captured the beauty of VERMONT in this wonderful state of mine !! Thank you. Hallo Peter, before I can write a comment your painting is sold. Congrats!! And so we can see another frosty panorama on your homepage with great cool pastel colours in the background and the warm vivid red of the barns as a charming delicious contrast in the foreground. Thankyou for sharing the video. “Plein air” is hard in wintertime. It shows your passion for painting. Even if it’s cold outside you can’t get enough and it’s so nice to watch the progress of your work. You are such an inspiration to me as an artist. Thank you for this. What a great video, Peter. Love watching you create. Thank you! The painting ” Orchid View Farm ” is beautiful and I loved the video. Thank you for sharing. I am fortunate to be your guest – ” Day in Vermont “. I was also a Huntoon Print Winner. Thank you !! I live in Seattle and come to Vermont about twice a year to visit my grandparents. It is them that introduced me to your work. Man, I love Vermont. Your paintings make me feel like I am there. Watching you apply color to a surface is witnessing magic in the making. Bravo. I agree, it is magic watching the painting come alive! Vermont provides an unlimited canvas of beautiful subjects. Thank you all very much for continued support and comments. I couldn’t do it without you! Not only did I love watching the video, I love reading the comments. You do misplaced Vermonters a great service by keeping us connected to the best of “home”. Thank you. I totally get absorbed into your paintings and the methods of perspective you apply in your work. I particularly appreciate your attention to a warm sky on this chilly morning. Thank you for sharing this video. Thank Peter! Love the barns. And thanks for the tip about the importance of subtlety. Hope all is well. Stay warm! I love this painting of the barn in Vermont. I live in Massachusetts, very close to the Vermont border. Many wonderful memories of Vermont with my parents! Thank you Peter!! !